Boxing history was probably written in Hameln (Germany) Saturday night (Dec 10) but it was unfortunately for all the wrong reasons: German supermiddleweights Christian Pawlak and Baker Barakat was all set to fight for what is called the German version of the World Boxing Union title held by Pawlak. The fighters had entered the ring, the national anthem had been played when a member of Barakat's cornermen discovered that Pawlak wore a different pair of gloves than had been agreed on - or so it was claimed by Team Barakat. Pawlak and his team insisted on that he as a champ could choose gloves. Either way Pawlak wore Reyes gloves, and Barakat Benlee gloves and no agreement could be reached and the fight was eventually canceled and neither fighter was paid. The undercard to Cecilia Braekhus vs Klara Svensson feature lightheavy Tim-Robin Lihaug (16-2) vs Czech Tomas Adamek (25-14-2) and cruiserweight Kai Robin Havnaa (8-0) take on Lars Bucholz (27-10). For both men it's frst time they get to fight in Norway. Havnaa's father, Magne, was WBO champ but spent his entire career fighting out of Denmark. MK Event of France close out a big 2016 with a big show in Noisy le Grand December 17. Topping the bill is bantamweight Nordine Oubaali (10-0) who take on Mexican Julio Cesar Miranda (40-12-2) with the WBA Intercontinental title at stake. In the co-feature EU welter champ Mohamed Mimoune (16-2) defends the title against Damien Martin (25-8-4). Also on the bill are supermiddles Christope Rebrasse (24-5-3) and Hadillah Mohoumadi (20-4-1). Rebresse take on Spaniard Carlos Esteban (12-2) while Mohoumadi is in against Ruslan Schelev (13-6). MK Event open 2017 with a big show January 21 topped by EBU superwelter champ Cedric Vitu (44-2) defending the title against Isaac Real (16-1-1). 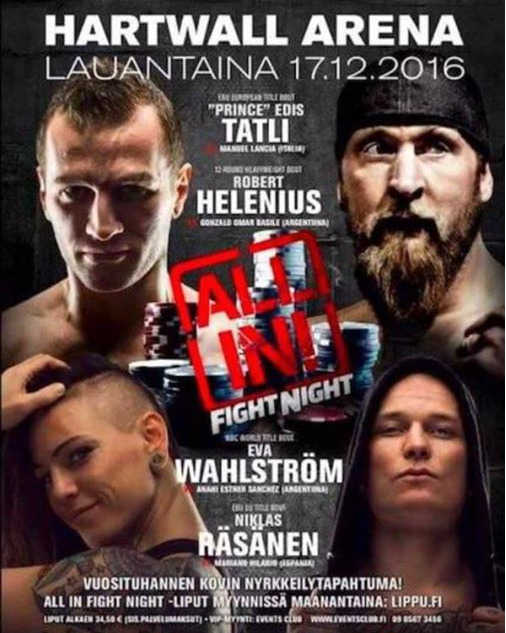 All In Fight Night in Helsinki goes ahead at the Hartwall Arena in Helsinki on Saturday and all main event fighters were on hand for the final press conference. EU supermiddle champ Mariano Hilario was stuck on the Istanbul Airport though and was so late in arrival he missed the traditional staredown against challenger Niklas Rasanen. Heavyweight Robert Helenius cash in a big payday, reportedly over 100 000 Euro, for his fight against heavily tattooed Argentinian Omar Gonzalo Basile and is ready for fight after more than 100 rounds of sparring. Helenius expects a big 2017 and have his sight set on a world title. EBU lightweight champ Edis Tatli, Finland's highest ranked boxer today, defends the title against Manuel Lancia in what is the main event of Dominus Boxing promotion. Felix-Promotion in Hungary close out 2016 with a show in Budapest on Saturday with hardpunching lightheavy Richard Baranyi (12-1) defending the WBO Euro title against Alis Sijaric (also 12-1) from Switzerland. In other action cruisers Tamas Toth and Guyla Bozai meet for the third time and for the second time with the Hungarian title at stake. The two previous fights have ended in draws but since then Toth won the national title. Middleweight prospect Norbert Harcsa (7-0) takes on Frenchman Chaquib Fadli (13-8) on the undercard.